I once spent a summer working for Commercial Union Life Assurance. I always wondered how life could be assured. But I never bothered to ask. The company sprawled across several floors in the Toronto Dominion Center, three black glass towers full of grey-faced slaves. I wore a skirt and pantyhose on the subway in the muggy Toronto summer, itchy and hot. 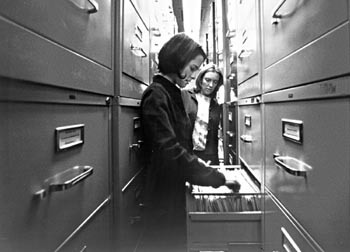 I had two duties: one was to take a list of numbers and go down to the filing dungeons in the basement, miles and miles of corridors full of colour-coded drawers…find the files…bring them back up, microfilm them, then take them back down and refile them. My “boss” was a gay man named Bob whose job it was to write up the list of numbers. He would tell me about the wild costume parties he threw on the weekends but I never saw him wear anything but beige. I worked with a woman who was 21, had two children, and had never spent a night alone. She would look in her little hand mirror and say “I’m so old, I’m so old.” And I thought…yup, you are. My other duty was to collect a wheeled cart full of all kinds of computer printouts each morning, and deliver them to all of the various departments. I always got lost amongst the cubicles and mixed up all the printouts. When I left at the end of the summer nobody noticed.